Postcard from Naples 2 – First general impression —a painted photograph, not true color photography. The technique was quite common at the time of this postcard. 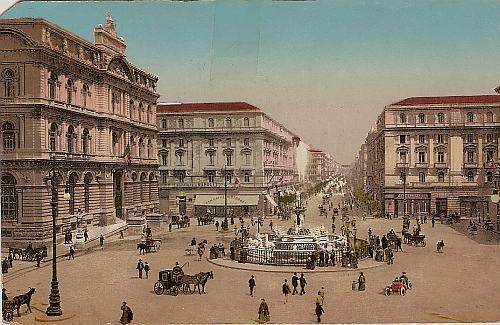 The official name of the square shown in this postcard is Piazza Giovanni Bovio. It is, however, most commonly called by Neapolitans Piazza della Borsa [stock exchange] because of the presence of the large stock exchange building on the left, still very much in existence. The building was started in 1895 and inaugurated in 1899 and was meant to house both the stock exchange and the chamber of commerce. The architect was Alfonso Guerra (1845-1920), known as an “eclectic” architect, which is to say that this particular building is not one of the typical Art Nouveau structures of the day. It is slightly neo-Renaissance with many other things hanging off of it. (Excuse the technical language!) In style, it reminds me of the “barochetto romano” of the train station at Mergellina, but I'm not an architect (as you may have already figured out). In any event, everything visible in the scene (except the central fountain)—all the buildings as well as the long, straight boulevard (Corso Umberto I) running into the distance (to the train station, one mile away) is a product of the Risanamento, the mammoth urban renewal project (see this link) to rebuild large portions of the city between the late 1889 and 1915. Before 1889 there was no square here, but there was a large Piazza del Porto (Square of the Port) located out of sight of this scene to the right and close to the port. That square no longer exists, but it was, indeed, a bustling place, a market, a hive of activity; it was also the site of the ceremonial inauguration of the Risanamento, itself. The current official name of the square is due to the presence of a building where Giovanni Bovio (1837-1903) lived, a prominent philosopher and politician of the post-unification (1861) new Kingdom of Italy. Still looking for a date? Well, the stock exchange was opened in 1899, but the main road to the train station, Corso Umberto I, was opened earlier, in 1894. The street was named for King Umberto, the second king of Italy and the monarch who initiated the Risanamento of Naples. The road picked up the nickname (still current) of the rettifilo [straight line] because it was unusual at the time to have straight roads in Naples. So, let's say the postcard is from between 1894 and 1899+. Looking at traffic, it's all pedestrian or horse/mule-drawn carriage traffic with one cool exception: there's one car (lower right)! One lonely car. Very small, open, two-seater. That, friends, appears to be the FIAT 4 HP. It was the first model produced by FIAT. Eight examples were produced in its first year (1899) and total of 26 between 1899 and 1900. Water-cooled 0.7-liter (679 cc) 2-cylinder, rear-mounted engine hooked to a three-speed gearbox. (No reverse gear.) Top speed of 35 km per hour (22 mph). Used 8 liters per 100 km (35 mpg-imp; 29 mpg-US). Good mileage. Nice machine. I want one. So, my verdict on the date is 1900 or 1901. It seems to me there would be more motorized traffic if it were much later.